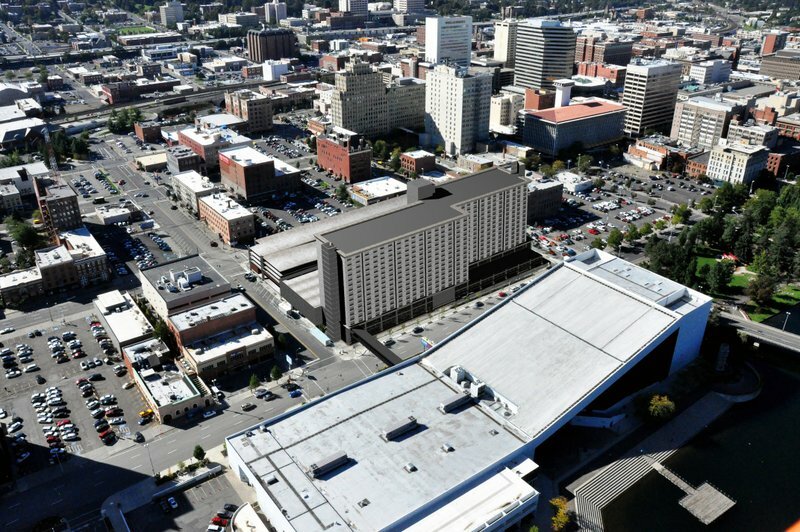 On Tuesday September 10, the Spokane Public Facilities District Board of Directors approved the final sale and transfer of a District owned, downtown piece of property to the Worthy Group to develop a nationally branded, multi-story, "convention" hotel. 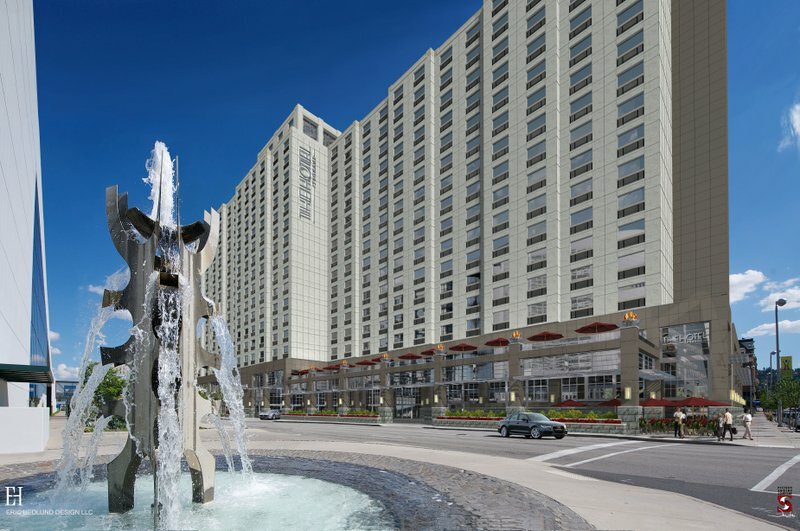 The Davenport Hotel Collection owners Walt and Karen Worthy purchased the entire block just south of the INB Performing Arts Center to build a 721 room hotel with over 900 parking spaces in a new attached parking garage. The new hotel will also have 70,000 square feet of meeting space which includes a 19,000 square foot ballroom and over 25 meeting rooms of various sizes. A formal appraisal as required by Washington State law sets the value of the 120,000 square foot parcel along Spokane Falls Boulevard between Washington and Bernard at $6,730,000. The sale price is $6,670,000. "The public receives a number of outstanding benefits by selling this property to the Worthys," said Kevin Twohig, CEO of the District. 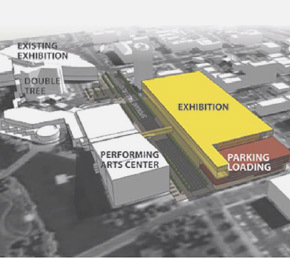 "Covered parking with a direct connection from the hotel to the Convention Center and the INB Performing Arts Center just to name one. The new jobs and increased tourism created by the Worthys' new hotel will also greatly benefit the entire region." • The District also gains a condominium interest in the garage that more than doubles the number of parking spaces available for public and district use, with no operational or capital costs. • The District will be relieved of any ongoing environmental remediation exposure on the property. The Worthys have committed to remediate the entire site. • The District is guaranteed an annual payment of $400,000 with future escalation for shared use of the District's parking spaces. • The District will be able to maximize the investment taxpayers are making in the Convention Center Completion Project because of the construction of this large 4 star convention hotel. It is expected that the hotel will attract new business to the Spokane region. More groups, and larger groups can now be accommodated. A $10 million guarantee from the Worthys will be paid to the District should the hotel not be completed. The property was used until recently for public parking. But its long term future, as outlined in the District's Vision 20/20 strategic planning document, calls for it to be used for Spokane Convention Center enhancements. "A multi-million dollar hotel clearly qualifies as an enhancement," said District board chair Mick McDowell. "Walt and Karen's project, coupled with our own $55 million Convention Center Completion effort will have a dynamically positive impact on Spokane and the surrounding area." Why does Spokane need this hotel? As the Convention Center Expansion reaches its full potential and has the greatest economic impact, a headquarters hotel adjacent to the CC has been identified as a significant requirement. Why is the District involved with this project? The Vision 20/20 Master Plan identified a number of future opportunities for the District and the CC. In keeping with the Master Plan, the District acquired the block south of the INB Performing Arts Center and began planning to complete the Exhibit Hall project that was approved by the voters in 2002 and 2012. Developing a convention center headquarters hotel is a significant next step in reaching Vision 20/20's goals. What specifically is the District committing to? The District will provide the property and a skywalk connection to the CC. The Worthy Group will build a headquarters hotel of at least 700 rooms and a 900 space parking garage---the District will own 300 of those spaces. Are there costs to the District for this agreement? Yes. The skywalk and environmental remediation are estimated to cost a total of $2.5 million. Site remediation costs are capped at $500,000. Where will the money come from to pay for the obligations the District is committing to? The costs for the skywalk and site remediation are included in the funds for the current completion project. What gives the Board the authority to take such an action? State law authorizes the District to "acquire, own, sell, transfer, lease and otherwise acquire or dispose of property … under terms approved by the [Board]." (RCW 36.100.020 and .070) The Board also has a specific policy addressing acquisition or disposition of property. Board policy #3.7 Finance: Purchase and Disposal of Capital and Attractive Assets. Has the District looked at the risks/opportunities of a hotel development adjacent to the CC? The District completed a "Spokane CC Hotel Development Proposal Review and Analysis" in 2012. This report is available upon request and will be posted on the District website. When did the Worthy Hotel project start? On September 11, 2012, the District Board, in open session, authorized the execution of a Letter of Intent that set forth the preliminary interest of the District and Walt and Karen Worthy with respect to development of the South Site Property. The LOI set forth a number of conditions, due diligence by both parties and a recognition that a public process, including disclosure of information, would occur with respect to the development. *Schematics are subject to final design. If you need any further information, please contact Kevin Twohig at ktwohig@spokanepfd.org.